At the end of March the DfE published the estimates for Attainment 8, English, Maths, Ebacc and Open for last year’s (2016) cohort, but recalculating them using this year’s conversion values (a C is worth 4 in 2017 but was worth 5 in 2016). For most schools this ‘shadow data’ will have the effect of raising school P8 scores by about 0.5. Confusingly, the DfE have only released 2016 estimates for some, not all, subjects (no science, no humanities, no MFL estimates) so these subjected will still be using the old conversion where a C is worth 5 points). 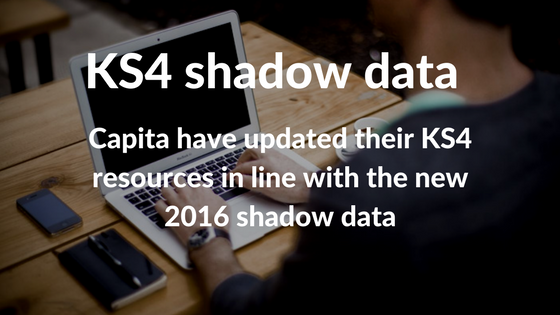 Capita have release a new version of the KS4 resources which incorporates the new values and it is available to download from Capita’s assessment newsfeed here. As the updated templates will probably produce a better P8 value I would expect most schools to be keen to update (although the latest changes do an extra level of complexity to the calculations). Note that Capita’s download contains only the revised autumn term templates. You’ll still need to clone these templates and replace the result sets to create the spring and summer versions. Schools might find it useful to keep a copy of their original templates, in case the goalposts change again!